Whatsapp has given lots of features and every feature made for some important reason. But some features are made without reason and we always think why it puts on Whatsapp. Whatsapp has added and updated lots of features when new requirement arise. Whatsapp is used for Group discussing, marketing purpose, and individual chat. Have you noticed the color of group member contact information during chat? You will see different color assigned for particular user. We don’t know why it’s showing various colors for different group member. Often we ignore it. We never try to curious it why Whatsapp showing like this because Whatsapp never gives feature or things without any reason. Whatsapp randomly shows various colors for participants of group. You can see during chat in group every member showing with different colors status. There is no logic for different color on Whatsapp. The company has never shared with us the logic behind the color system. However I have research on it and perform some experiments. I have got some interesting things which I would like to share point by point. This feature was available when Android Lollipop Version rolled out. This feature is supported by Lollipop 5.0 and higher android version. 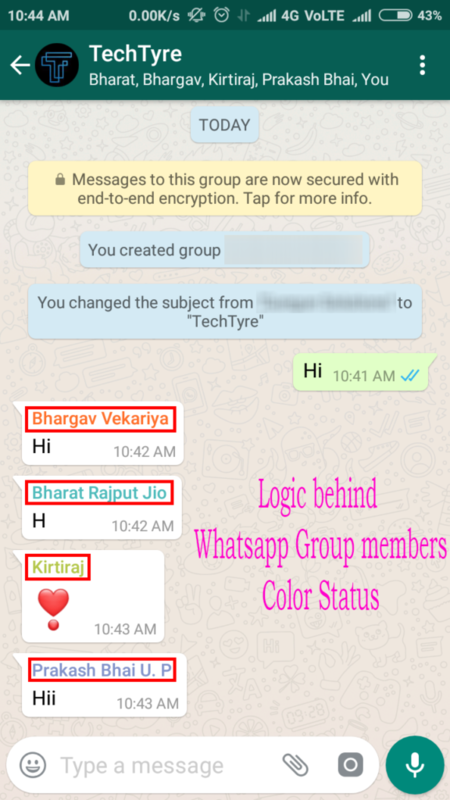 When you create any group in Whatsapp it automatically assign color in descending order of participant name. It means whatsapp provides 256 different colors for its 256 participant’s member. Any removed member or exit member’s previous post will remain with grey color. Assigned color of group member will remain same for all group members in their own mobile phone. You will see same color for all group members if you check other group member’s mobile phone. White color never assign to any group member. When you exit from the group Whatsapp automatically change color of each member and make sequence in descending order. If you want to change this color you just need to exit from group and return to add that group then color will be changed for you and you can see different color is assigned for contact. However to check this you need to check other group member mobile phone. You can’t see your assigned color in your own phone. Your all posted content will remain unlabeled for you in your own mobile. If same member added in another group then assigned color may be different in both groups for same member. Whatsapp is very sensitive for its rules and term of conditions. Whatsapp has restricted when you try to test with carelessness. Suppose, when you exit twice per day from group you can’t access again in same day and also admin can’t add again in group. You have to wait for 24 hour, after a day you can easily access in group through admin.